Creating WordPress Custom Post Type is very easy as we saw in tutorial How to Create Custom Post Type (CPT) and Custom Taxonomy in WordPress. Please follow that tutorial completely before applying below tips and tricks. In this WordPress tutorial we will go over list of simple tips and tricks which will help you customize your WordPress Custom Post Type. How to get RSS Feed for your Custom Post Type in WordPress? By default new Posts you create for your Custom Post Type doesn’t appear in your default RSS feed. Well it’s very easy to create custom RSS feed for Custom Post Type and Custom Taxonomy. Just use this pattern and you should be all good with RSS feed. Here deals is a your Custom Post slug which you have used in this register_post_type( 'deals', $args ); in How to create CPT tutorial. Where type is a Taxonomy and domain-deals is one of the Taxonomy. In both above URL replace crunchify.com with your sitename and you should be all good. Do custom post types generate RSS feeds? 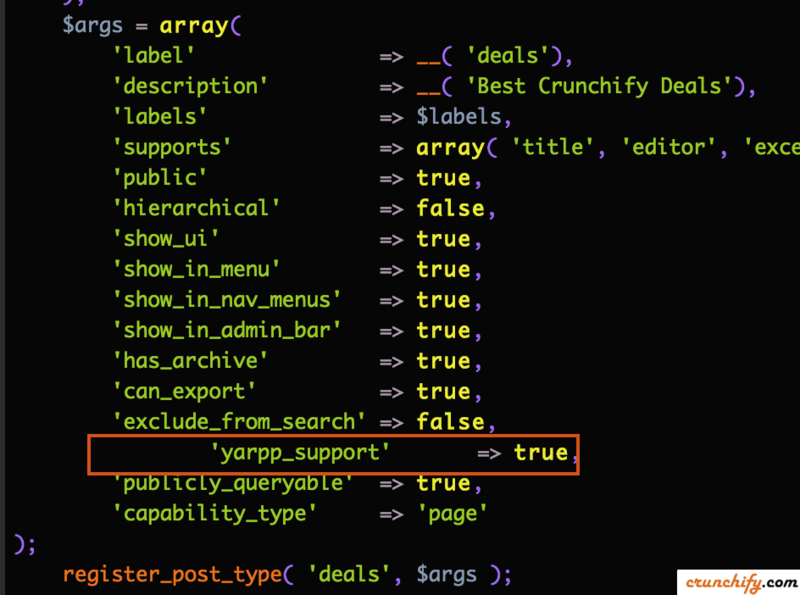 How to add/enable YARPP on custom post type in WordPress? 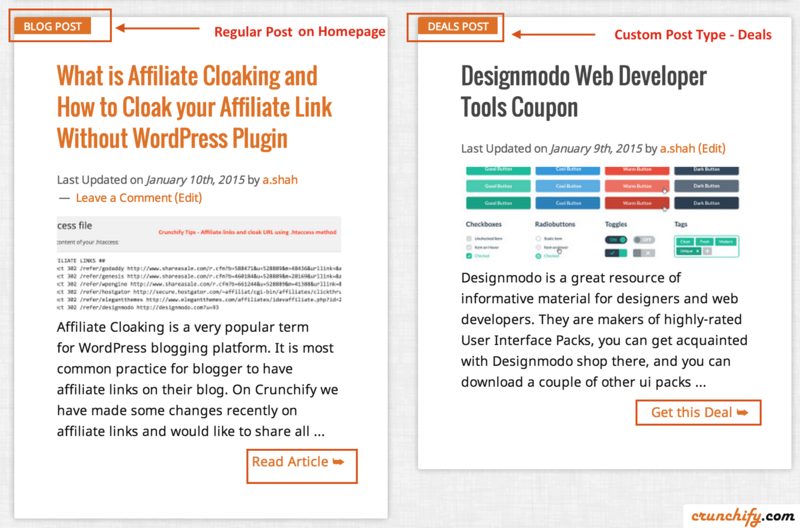 On Crunchify we use Yet Another WordPress Posts Plugin to show related posts. Yet Another Related Posts Plugin (YARPP) displays pages, posts, and custom post types related to the current entry, introducing your readers to other relevant content on your site. Once you add above code to functions.php you will see one additional option in YARPP admin setting page. 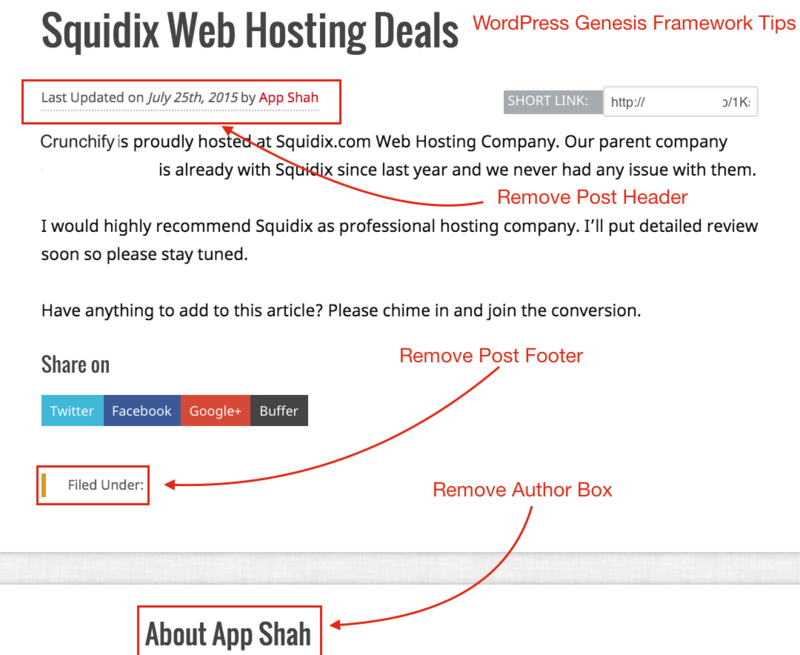 How to Remove Meta Header, Post Meta Footer, Author box and Share buttons in genesis framework? Creating Custom Post Type is very easy as we saw in tutorial How to Create Custom Post Type (CPT) and Custom Taxonomy in WordPress. Please follow that tutorial completely before applying below tips and tricks. Just put below code to your WordPress theme’s functions.php file to disable all 4 sections. NOTE: this works if you are using WordPress Genesis Framework. Take a look at Deals page. We have removed all 3 sections from post. How to show Custom Post Type Posts on Home/Index/Front Page? By default Custom Post Type doesn’t appear on Home/Index page. If you want to have it on Home then just add below code to your theme’s functions.php file.